I’ll admit, they do look kinda cool, but I tend to be somewhat of a minimalist when it comes to chicken keeping. I prefer to stick to the basics (that means no chicken sweaters either…). Heck, my flock doesn’t even have names, other than the rooster, which the Prairie Kids named “Chicken Nugget”. That being said, I do like to provide them with a little bit of extra nutrition in the winter when they can’t be out foraging for lovely bugs and green stuff. Our long, cold Wyoming winters wear on everyone after a while, even the critters. 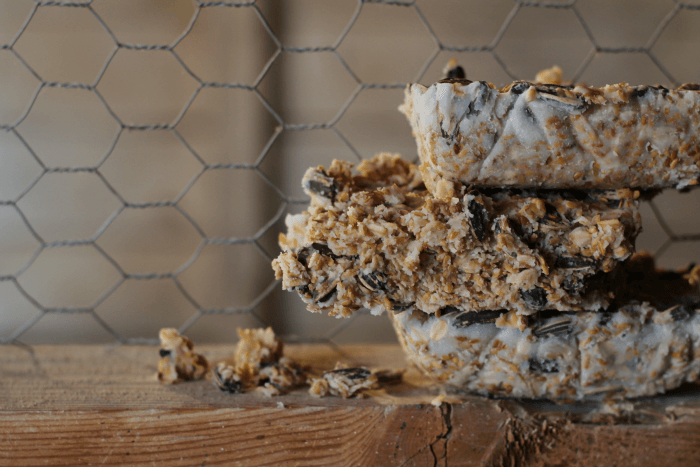 These homemade suet cakes are modeled after the ones offered to wild birds. My version uses tallow and is an excellent way to offer your flock a bit of extra fat and energy, especially during the winter months. Line a nine-by-five inch loaf pan (or any similar sized pan) with parchment paper or foil. Mix the seeds, fruit, and grains together, and place in the pan. Remove it from the pan by lifting up on the liner to pop it out. 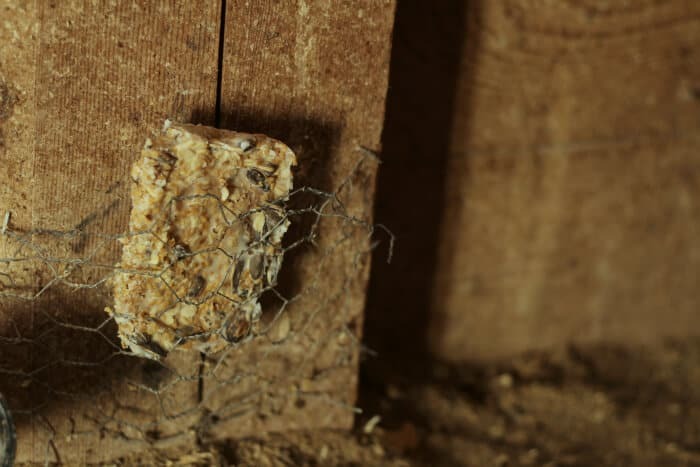 You can cut it into several pieces, or feed the whole thing at once by either tossing it in a feed pan, or pinning it to the wall like I did with a scrap of chicken wire. This recipe is extremely flexible. Don’t hesitate to play around with it! Some other ingredients that would make great additions or substitutions to this recipe would be unsalted nuts or peanut butter. You can also sprinkle in spices and herbs such as garlic powder or cayenne pepper, oregano, rosemary, etc. If you don’t butcher your own animals, see if you can purchase fat trimmings or suet from your local butcher shop. Here is my tallow-rendering tutorial. Looking for other cool ways to use tallow? Check out my tallow soap recipe, my tallow candle tutorial, and how to make the best french fries ever with tallow. Another option is to save the fat that you drain from frying up hamburger and sausage. Store it in the freezer until you have enough to make this recipe. A little bit of bacon grease is fine, but I would avoid using large amounts because of the nitrates and sodium it contains. Line a nine-by-five inch loaf pan (or any similar sized pan) with parchment paper, foil, or plastic wrap. Mix the seeds, fruit, and grains together, and place in the pan. Allow to harden completely. You can speed up this process by sticking it in the refrigerator for a while. Remove it from the pan by lifting up on the liner to pop it out. You can cut it into several pieces, or feed the whole thing at once. 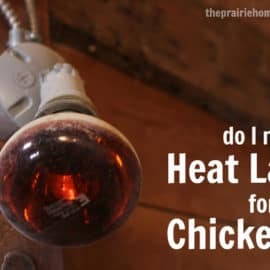 Do My Chickens Need a Heat Lamp in Winter? 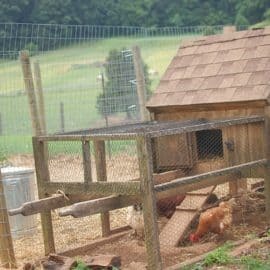 Do My Chickens Need Supplemental Lighting? 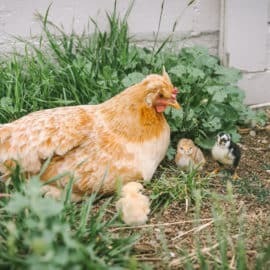 The Ultimate Guide to Broody Hens Do My Chickens Need a Heat Lamp? 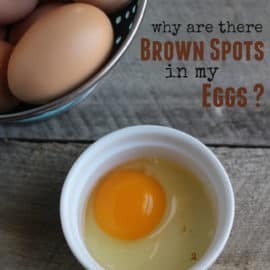 How to Build a Chicken Run What are Those Spots in my Farm-Fresh Eggs? I was wondering what you thought would be the best way to preserve these? Say I wanted to make a bulk batch of them to get through the winter. I know there is conflicting advice about how long tallow takes to go rancid. If I wanted to preserve a very large batch of them, what would you recommend as the best way to store them? Thank you for this post! I won’t give my birds anything made with meat.. That being said, what can be used in substitution of the tallow? meat is fine as long as its cooked………I also catch eels from the dam when we have a burning pile ready to go…chargrill them and then give to the chooks…they LOVE it. Hi Loyda, Remember– chickens are omnivores, not vegetarians. They were made to eat meat regularly in their diet. However, if you don’t want to feed meat that’s fine. However, I’m afraid using something like coconut oil would be prohibitively expensive and probably not worth it. That’s why chickens love bugs. They will cannibalize dead animals and birds (even their flock-mates). If we have leftover cooked meat (stews, ground meat, roasts) instead of throwing it away (unless it is spoiled or growing) the biddies get it. And, they LOVE it. A varied diet makes for healthy flock! I’m sorry, I don’t understand Vegans insisting on making their pets and livestock vegan, too. It is unhealthy to force carnivores and omnivores to eat unnaturally. They eat the food with the nutrients they NEED! Thanks for all your excellent articles, Jill!! My chickens are great mouser’s. what variety of chickens do you have that are good mousers? Coconut oil, organic preferably and it has many health benefits. My four girls are hard done by. It’s up to them to scratch in the compost pile to find single serves of the ingredients. Thank you for the recipe. I don’t have chickens yet, but I borrowed 3 from my neighbor to weed my garden, fell in love with them, and will be buying chicks this week. I have made suet in large batches for wild birds for years. I pack the suet in toilet paper rolls and store in the freezer until I need it. It is easy to peal the cardboard from the suet. 3 suet tools will fit into a standard small suet cage. Love the toilet paper tube idea! Neat idea for using up toilet paper tubes. After peeling the tubes off, you can reuse them again for a quick fire-starter because some of the suet will have soaked into the tube. What a fun treat for the chickens!! Great use for the extra pig fat I have on hand. 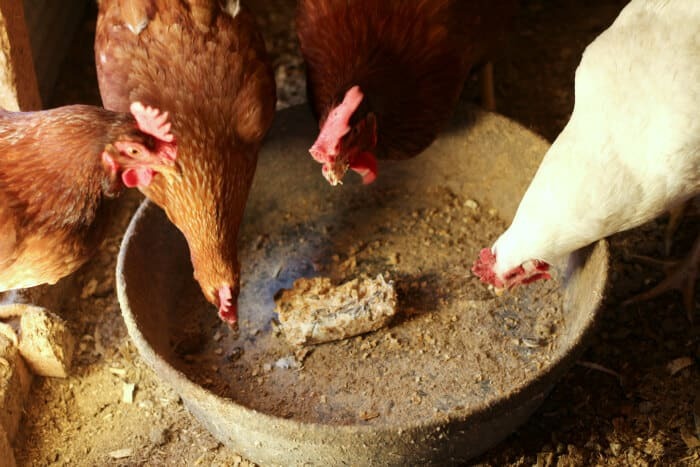 Does the tallow or meat rendering have a specific benefit to the chickens? Why not just add a handful of the other ingredients to their regular feed? I know chickens are not vegetarians, just curious if the tallow provides them with anything specifically needed in winter when forage is slim. In very cold climates the fat provides extra calories to keep the birds warm. My chickens have been laying all winter and need all the calories they can get. There isn’t much to find outdoors when it’s minus 20 and 24 inches of snow! 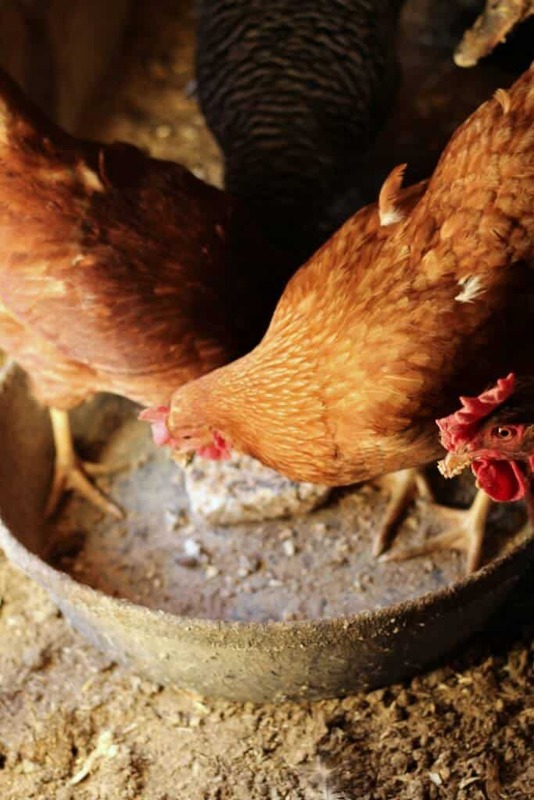 Chickens would not be naturally eating pigs or cows, or any creatures larger than themselves. This is unnatural and you know what happened when the beef industry fed cows cows – mad cow disease. I do not believe this is responsible animal husbandry, and could be potentially dangerous. Thank you. Remember– it’s not entirely natural for a chicken (a jungle bird) to be living in cold climates, locked up in a chicken coop, either. Chickens are omnivores. I agree with you– it’s not wise to feed chickens to chickens or cows to cows, but I personally don’t have a problem providing beef fat as an added nutrition source during the winter. But I respect your opinions. Cheri, i bet you’d be surprised what chickens would peck at if they were truly free range with no restrictions. If in the wild, and they came across a cow or pig carcass, i would guess hunger would take over and they would eat what was available. Not saying this would be a common thing to have happen, just wouldn’t call it unnatural or irresponsible animal husbandry. My chickens have 4 acres to play all the time and drastically help me with the field mouse population. Lot smaller scale, but meat eating none the less. Plus it’s fun watching them chase after them! I’m definitely gonna try this with all the bacon grease and leftover scraps to make them last a little longer for the girls. Oh yes… field mice are a BIG treat in the chicken world! Just asking are there nitrates or nitrates in bacon ? Can I make this for winter birds? Hi All, this comment is for anyone. Can you use lard from the grocery store? Also, can you also use this for the wild birds? 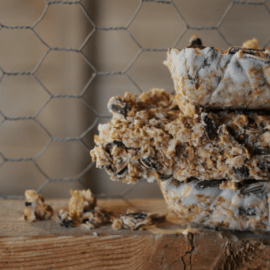 I buy lots of suet from Tractor Supply and would love to make this at home. I make my own suet for the wild birds every winter and use lard as it comes in 1lb chunks. I add peanut butter, mixed bird seed that includes sunflower seeds, oatmeal, and cornmeal. I freeze it in the plastic containers that store-bought suet comes in then pop it out to fill my suet feeders. Even the wild turkeys love it. By the end of last winter, we had a rafter of 80 hanging around the house and property. I get free fat trimmings at Kroger. I recently got enough to make 66 muffin-size suet cakes and froze them. I thaw 3 at a time to give my 12 girls on days when it gets down into the 20’s or below. They gobble them up! At the end of the winter I see bird suet for sale at the farm stores sometimes as cheap as 3/1.00 . When I had chickens I bought some of these as a late winter treat…didn’t know they could be frozen or I might have bought a lot more. Jill, where can I find the recipe for the electrolyte solution you fed your chicks last spring? We have chicks arriving soon. When I render my our lard there are the “Cracklin’s” remaining, Can I mix that in with the recipe as well? 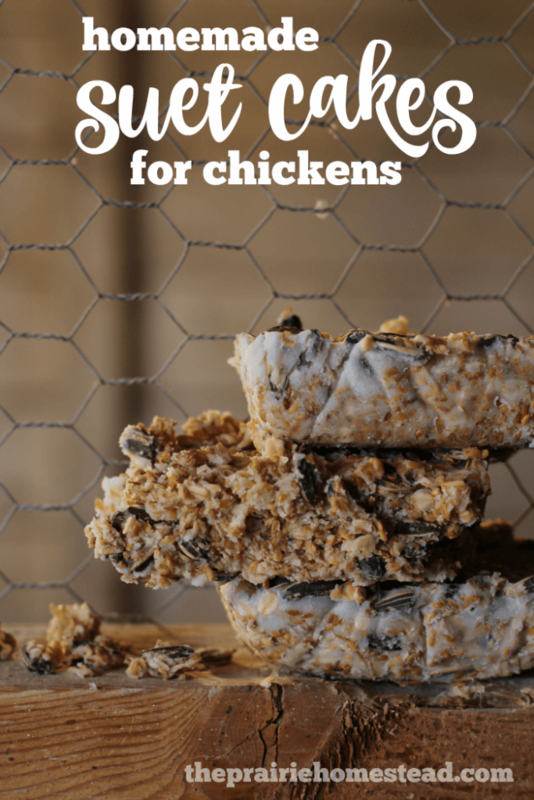 Can chickens eat peanut butter, I would like to make bird and chicken suet the same. What about lining a muffin tin and peeling back the liner for single servings? I live on a small farm and my dad makes huge suet cakes in buckets for our chickens to peck at all winter! But he makes them in the winter time and we can’t open windows, the whole house stinks!! !